Icy Dock has taken another one of its tried and true products and taught it some new tricks! Introducing the EZ-Dock Lite MB881U3-1SA 2.5” & 3.5” SATA and IDE hard drive adapter with docking station functionality. It features the new USB 3.0 interface for up to a 5 Gb/sec transfer rate but still backwards compatible to USB 2.0 transfer speeds. The MB881U3-1SA is perfect for any DIY user or IT Professional in need of a quality hard drive adapter. This adapter will work with both SATA drives and IDE drives and use them on a USB 3.0 interface. The 2.5″ SATA/IDE drives can be powered with the USB cable alone. A power adapter is included for faster or bigger 2.5″ hard drives or 3.5″ hard drives. Using the USB 3.0 interface will maximize the IDE drives read/write speeds not found on other USB 2.0 products. What benefits can be found in the Icy Dock MB881U3-1SA over other HDD adapters is that it is space saving, better heat dispassion, no messy wires all around the desk, looks nicer, and most of all USB 3.0 interface. 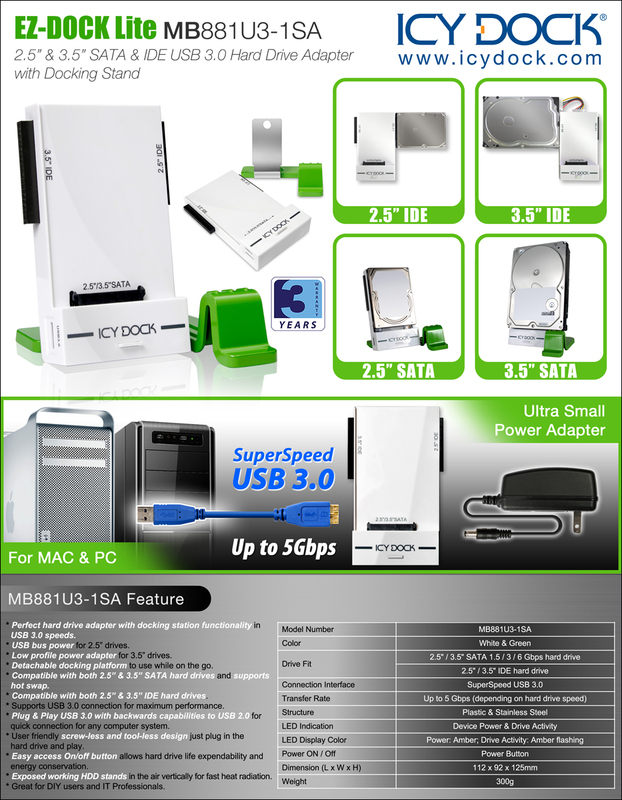 The MB881U3-1SA will accept almost any size of 2.5″ / 3.5″ IDE and SATA hard drives. The on/off button makes it easy to conserve energy and extend the life of a drive The MB881U3-1SA features a detachable stand which can be removed from the adapter for better portability, with the newer smaller included power adapter, the MB881U3-1SA can be easily slid into a laptop bag. This lightweight dock can lay on any surface for hard drive stability and is small enough to grasp with just a hand. The dock and the stand are light enough to move and reposition in different areas.